One day, I am going to buy a big piece of land running along the road. Any road will do. So I can put up some big silly statues that make no sense along it to keep drivers entertained. This one isn’t too odd. 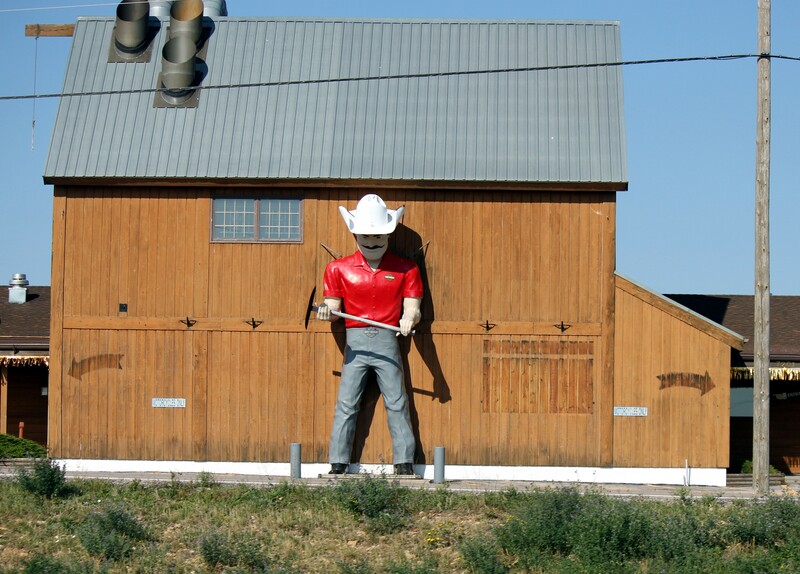 I have seen variations of the giant man statue. The amusement park that I grew up near had one so I’m fond of them. They were mostly made in the 1960’s. The first ones held mufflers, then they starting popping up holding all sorts of implements. This one is in excellent shape and holds a mining pick and has a Harley belt buckle in honor of the Sturgis Rally.. Nice. 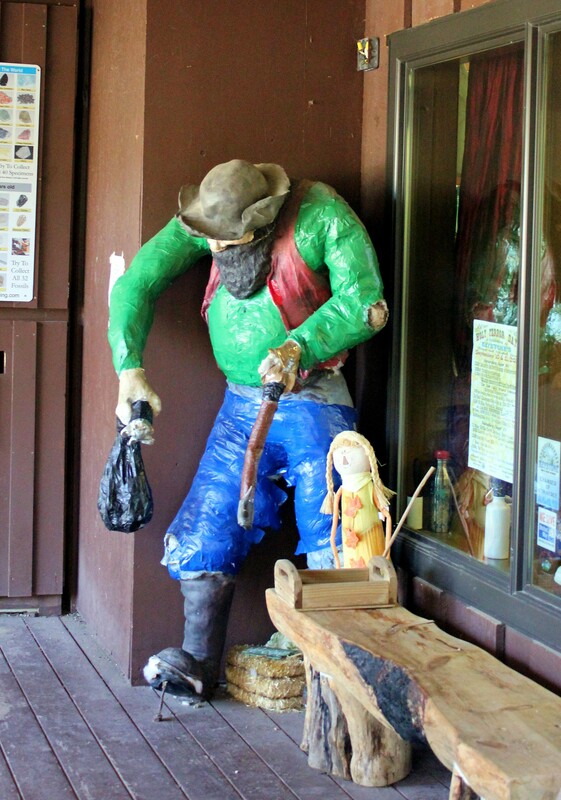 This miner was on the porch of the Big Thunder Mine in Keystone.I’m not sure if that’s a support or if he’s supposed to have trodden in gum. He’s a pretty gruff looking guy so I didn’t ask. If he needs help that doll with the supercilious grin looks ready to jump in. 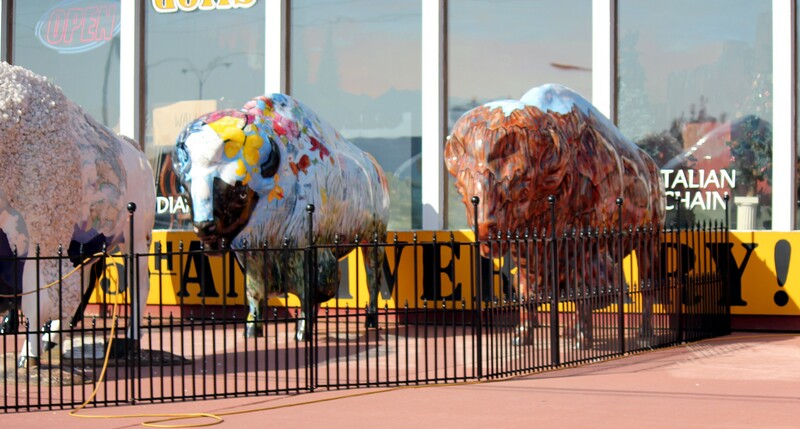 These bulls are outside of one of the billion or so gold/jewelery stores in Rapid City. It’s not every day that you get to see flowery bison penned outside a jewelry store. It’s a good thing there is a pen because a stampede of flowery bison would for sure panic the masses. And of course to go with the flowery bison, way out in the Badlands, at the ranch store (where you can see prairie dogs in a pen “Free!” as opposed to all over the fields) there is a six tonne prairie dog. 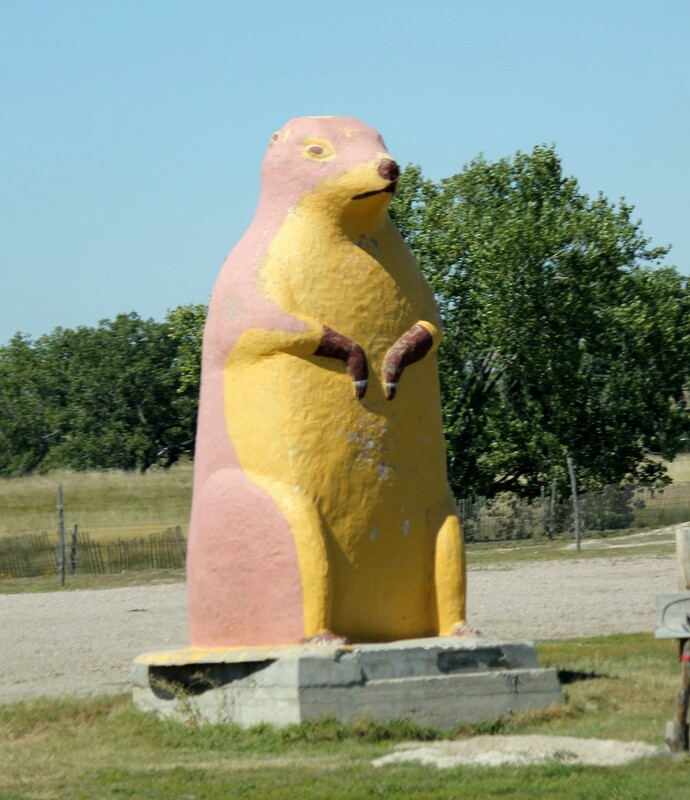 A pink and yellow six tonne prairie dog at that. I bet that thing could dig a heck of a hole. 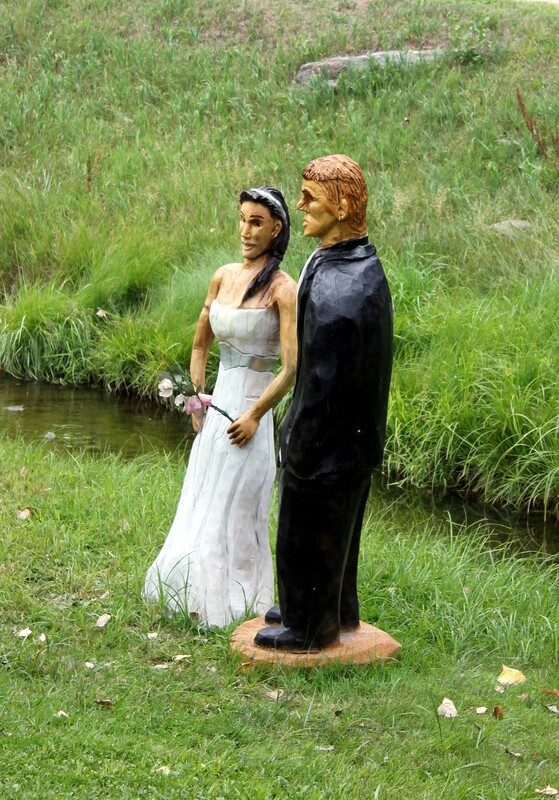 Then there are these wooden statues also in Keystone. Wouldn’t you like to see that in your front yard while going to fetch your paper every morning? 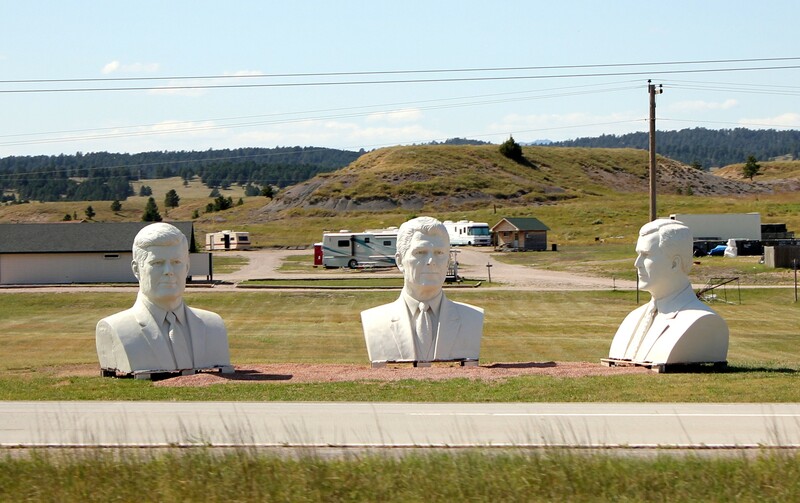 Mini Mount Rushmore? These are sitting in a random field. Not sure what that’s all about but thanks. This here is the yard of the King of Silly Statues. There’s a 25 tonne bull’s head being guarded by alien skeletons while red robed freaky beings overshadowed by a gigantic hammer look on. There’s also a large flower-pot with metal flowers, some dinosaurs and odd bugs, a few dancing robots and I believe that is a two-headed bison. But this is my favorite…absolute genius. It’s nice to know in a day and age when so many people walk down the street (or drive) with their eyes glued to small screens that are still people in this world who have the balls to be a little different, to be a little silly, to be creative and amusing and entertaining and eccentric and charming. If you can’t go to mount rushmore, bring mount rushmore to you! i can see there’s a bit of drumheller Alberta with the T-Rex LOL 🙂 nice! Those cracked me up. Usually there’s some sort of business near by or explanation but not for those busts. They were just sitting there. Apparently someone took the old saying “Never explain” to heart. Makes me happy too! I want to be like that. Thanks for the smiles! Clicked on your blog from Struggling Dad’s and low and behold – South Dakota! Lived there three times, hold’s a special place in my heart – thanks for the walk down memory lane…better memories, before they imploded! Hope you enjoy your time out West. Thanks! And the good times will come back! Take care. 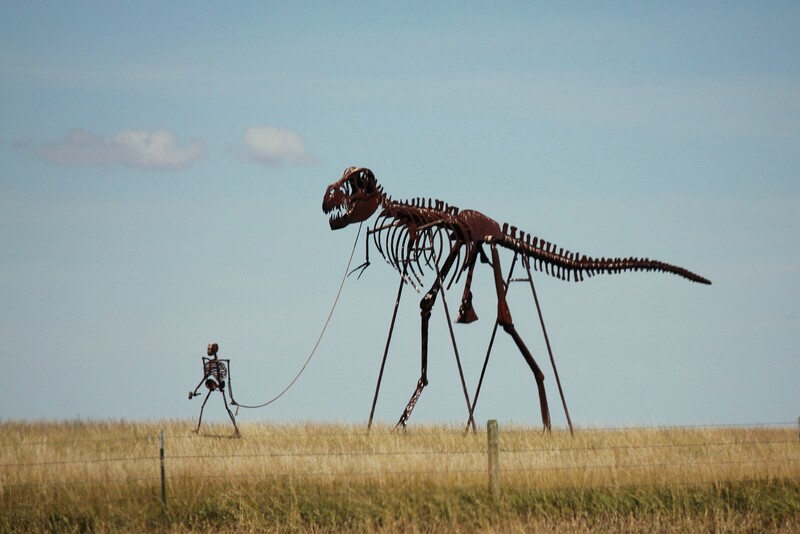 HAHAHA I saw the man walking his Tyrannosaurus last year on our way home from the Badlands and missed getting a photo of it! Glad you caught it. These are all priceless, and the wedding couple statues would freak me the heck out. Creeeeepppppppyyyyy! I had to stop myself from asking if I could buy those. I wanted so bad to put them in my sister’s yard. It took me going and coming to get that one photo of the man and dino. I put my camera speed up to 4200! and started clicking. The bison statues reminded me of the moose they had all over Toronto. I would have loved to have owned one. I hope you weren’t thinking of putting the wedding couple in MY yard. Creepy is right. Except for the man walking the dinosaur which I thought was hilarious, all the other ones kinda creeped me out. Hmmm, I’ll stay where I am and stare at trash instead.